One of our 2015 Communication graduates, Joe Sullivan, is now an Account Executive of Ticket Sales for the Cleveland Indians baseball team! 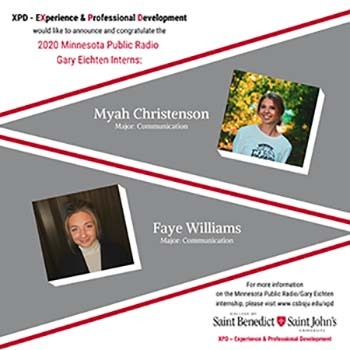 CSB/SJU's Communication major supplies you with theory and skills essential for your career and relevant to your life. Communication is an excellent foundation for many professions because it focuses on the versatile, valuable skills of writing, speaking, listening, persuasion, analysis and critical thinking. It also provides exceptional preparation for graduate studies or law school. Communication isn't just important to your profession, it's also key to your personal experiences and your role as a citizen in a society inundated with messages. We deal with contemporary topics like the environment, social media, political campaigns and healthcare communication, while incorporating well-established theory and practice. You will have the opportunity to examine communication as it relates to important societal issues like sports, gender, culture, family, relationships, social movements, civil rights, and traditional and new media. Our courses focus on the key areas of message design, analysis of communication, and communication and community, with an emphasis on creating a broad knowledge base that sets our graduates apart. Requires students to take courses in message design, analysis of communication and communication & community. Allows students to take a wide variety of Communication courses as part of developing their individual path toward graduation. Includes courses in media studies, communication theory and rhetoric & public address. A wide variety of classes that gives you the chance to learn about the different aspects of communication and discover what fits you best. A flexible major that allows you to tailor your courses to fit your talents, interests and goals. Service learning classes that let you put your communication skills into action. Opportunities for internships and other communication-related experience outside of the classroom. Professors who will get to know you, mentor and advise you and help guide your research. Small classes that let you interact with your professors and your classmates. "It feels like a huge gift to share music with people and to be able to experience it with them. So really I'm a communication junkie in all areas of my life." Read more from Margaret. Read our magazine by COMM students, for COMM students.